Move Free (120 tablets)- Save-On Nutrition Centre Ltd.
Move Free® Advanced Plus MSM comforts sore joints in less than 7 days. What are the ingredients in Move Free® Advanced that make it so effective? Uniflex® is a ground-breaking dual bioflavonoid antioxidant system. By protecting joints from the radical antioxidants that accelerate the breakdown of cartilage and other joint tissues, it helps keep joints working better and feeling younger. Glucosamine and Chondroitin help by lubricating, cushioning, strengthening, protecting and rebuilding joints. 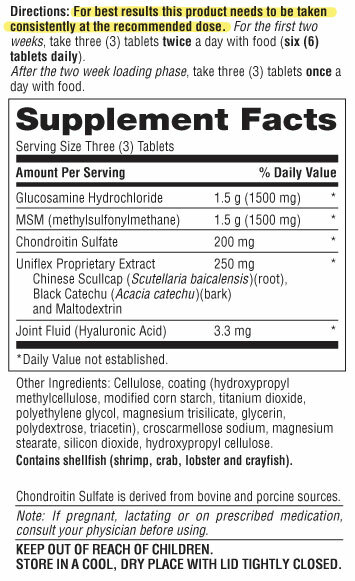 Glucosamine is a basic building block of joint cartilage, which helps to maintain structural integrity of joints and connective tissue. Chondroitin is a naturally occurring nutrient found in connective tissue. It is capable of binding water molecules to lubricate, cushion and support joints. Move Free® Advanced Plus MSM provides the added benefit of 1,500 mg of MSM (Methylsulfonylmethane), a natural source of sulfur found in the body which is important in the formation of collagen in joints. The amount of MSM found in Move Free® Advanced Plus MSM is the tested amount shown to support joint comfort and soothe sore joints. Move Free® Advanced Plus MSM offers a powerful, fast-acting combination of all these nutrients. Better and faster results! Welcome the next generation of joint health with Move Free® Advanced Plus MSM!